The Irish Music Archives at John J. Burns Library is delighted to announce the acquisition and display of Joe Derrane’s D/C# Gaillard accordion, a gift to the Library from his children, Joseph P. Derrane, Jr. and Sheila A. Harvey. The instrument is the second button accordion that Derrane commissioned from Bertrand Gaillard, a French accordion maker. Photo of Gaillard accordion. Joe Derrane Irish Music Materials, IM.M208.2017, John J. Burns Library, Boston College. Boston-based Joe Derrane (1930-2016), an Irish-American musician and composer, was well known for his innovative approach to the D/C# button accordion in Irish traditional music. He was born in Boston in 1930 to Irish immigrants Patrick J. Derrane and Helen E. (Galvin) Derrane. His family was musical, and, as a boy, he was captivated by performances by Cork-born melodeon player Jerry O’Brien on local radio. Derrane’s music career spanned over 60 years. From the mid-1940s to circa 1960, Derrane performed Irish traditional music in a wide range of venues across Boston, appearing frequently in bands in the Dudley Street dance halls. He was also a regular soloist on live radio. Copley Records first invited him to record commercially while he was a high school senior, and he went on to record with collaborators such as his mentor Jerry O’Brien. Photo of Joe Derrane with his Gaillard accordion. Photo by Sheila A. Harvey circa 2006. Derrane met Anne Connaughton while doing a series of gigs in New York City, and the couple married in 1955. Within a few years they were settled in Randolph, Massachusetts with their two children. With Irish music gig opportunities in Boston declining, Derrane switched to other instruments and music styles to support his family. Between 1962 and 1989, while holding various administrative positions at the Massachusetts Bay Transportation Authority (MBTA), he performed jazz, pop, and repertoire from other ethnic traditions. For ten years he played keyboard and synthesizer in a pop/jazz duo called Nightlife, with his son Joe on vocals and bass. Derrane retired from the MBTA in the late 1980s, and by 1990 had retired from music gigs altogether. In 1993, when Rego Irish Records and Tapes obtained the rights to re-release his early 78-rpm recordings on CD, Derrane’s music was heard by many for the first time. The CD, titled Irish Accordion, caught the attention of journalist Earle Hitchner, who interviewed Derrane and persuaded him to try the button accordion again. After six months of intense practice, his decades-long hiatus from the D/C# button accordion ended with a highly successful performance at Virginia’s 1994 Wolf Trap Festival. This pivotal event brought Derrane back into a new phase of recording, teaching, and international performance in Irish music. Derrane’s choice of accordion was integral to his playing style. In the 1990s, the D/C# button accordion system preferred by Derrane was no longer popular for Irish music; it had been eclipsed by the B/C system. Nevertheless, he stayed with the D/C# tuning, purchasing a custom accordion from Gaillard in 1995. In 1997 he purchased a second accordion from Gaillard with a new set of modifications. Derrane played the instrument on recordings and in live performances from 1997 until 2010. 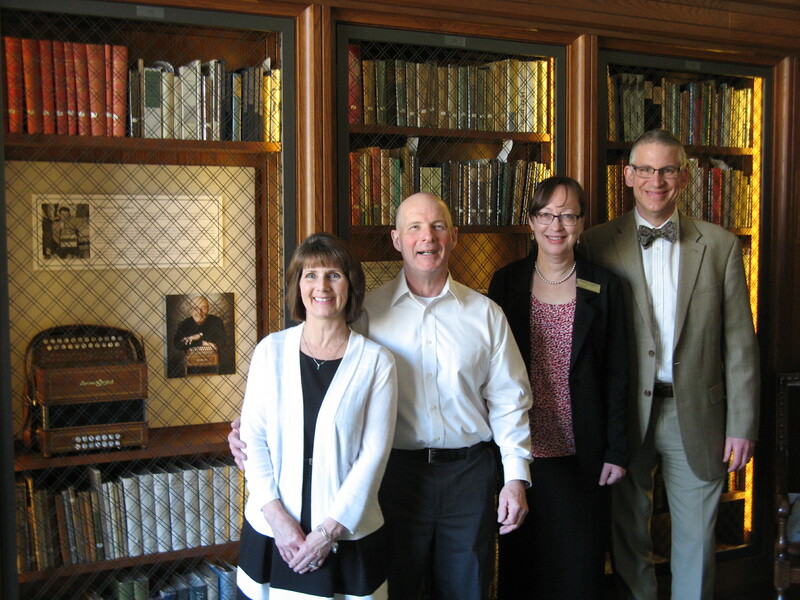 Photo of accordion display, with Sheila A. Harvey, Joseph P. Derrane Jr., Elizabeth Sweeney (Irish music librarian) and Christian Dupont (Burns librarian). Burns Library, April 2018. In 2004, the National Endowment for the Arts recognized Derrane with a National Heritage Fellowship, the nation’s highest honor in the traditional arts. He retired from performing following his final CD, Grove Lane (2010), but continued to teach privately until shortly before he died in 2016. A luncheon with members of the Derrane family celebrated Derrane and his accordion at Burns Library in April 2018. Also present was Séamus Connolly, formerly Sullivan Artist in Residence in Irish Music at Boston College and a long-time friend and musical colleague of Derrane’s. The accordion is the highlight of the Joe Derrane Irish Music Materials at Burns Library. The instrument, now retired from playing, is on display in the Irish Room alongside books, paintings, harps, and other items from the Library’s Irish collections. Burns Library looks forward to welcoming visitors to view the accordion. For more information about the Irish Music Archives and Irish Studies collections at Boston College, we invite you to get in touch via our contact form. Photo of Derrane family and Séamus Connolly with accordion display. Burns Library, April 2018. Boston Globe. 2016. Obituary of Joseph Derrane. July 26. Derrane, Joe. Liner Notes. The Man behind the Box. Joe Derrane. Mapleshade MS 10732. CD. 2006. Gedutis, Susan. See You at the Hall. Boston: Northeastern University Press, 2004. Hitchner, Earle. “Derrane, Joe.” In Companion to Irish Traditional Music, edited by Fintan Vallely, 207. Cork: Cork University Press, 2011. Hitchner, Earle. Liner Notes. Give Us Another. Joe Derrane. Green Linnet GLCD 1149. CD. 1995. Hitchner, Earle. Liner Notes. Grove Lane. Joe Derrane. Compass 7 4544 2. CD. 2010. Holtzberg, Maggie: Keepers of Tradition: Art and Folk Heritage in Massachusetts. Boston: Massachusetts Cultural Council, 2008. Ní Chaoimh, Máire. “Journey into Tradition: A Social History of the Irish Button Accordion.” PhD diss., Irish World Academy, University of Limerick, 2010. http://hdl.handle.net/10344/1616. Varlet, Philippe. Liner Notes. Irish Accordion. Joe Derrane. Copley COP-5008. CD. 1993. Varlet, Philippe. Liner Notes. Irish Accordion Masters. Joe Derrane and Jerry O’Brien. Copley COP-5009. CD. 1995. This entry was posted in Archives & Manuscripts, Exhibits & Events, Irish Music Archives, Irish Studies, Recent Acquisitions, Staff Posts and tagged Accordion, Boston, Boston Irish Musicians, Button Accordion, irish music, Joe Derrane, music. Bookmark the permalink. How wonderful for the Derrane family to donate this beautiful instrument in Joe’s memory! I fondly remember talking with Joe about his accordion and hearing him play so beautifully. He was a terrific gentleman and musician! The acquisition of Joe Derrane’s accordion by the Burns Library speaks of its longtime commitment to keep the multiple aspects of the Irish presence alive and honored. Where would the Irish or any culture be without music?